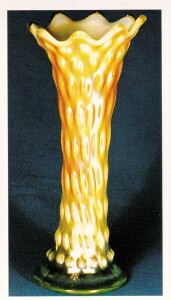 Fenton was stingy when it came to using opal in its carnival production. This technique was largely the property of Northwood & Dugan with Westmoreland also making substantial contributions. 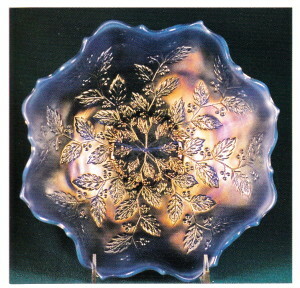 Nevertheless Fenton did make a number of pieces with opal edges on various base glass colors. These are all rare and desirable. It is these pieces that this article is all about. 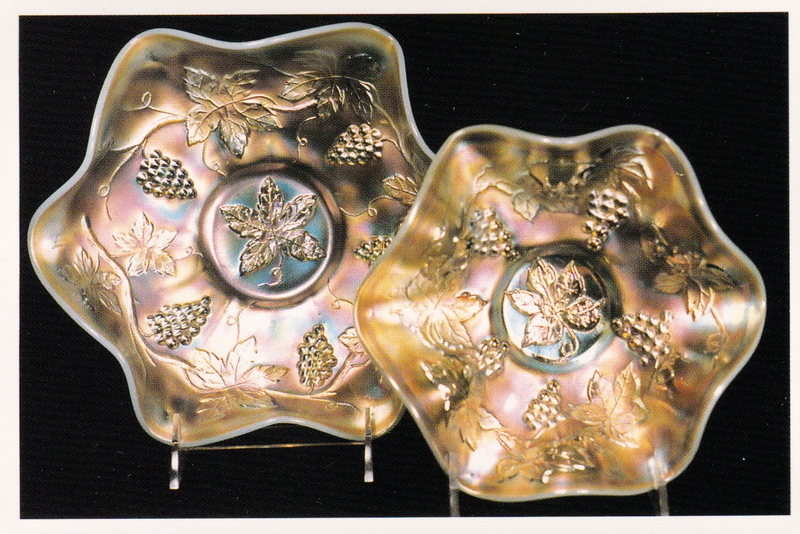 It should be pointed out that the opal on these Fenton pieces is a far cry from Northwood’s aqua opal or Dugan’s peach opal. 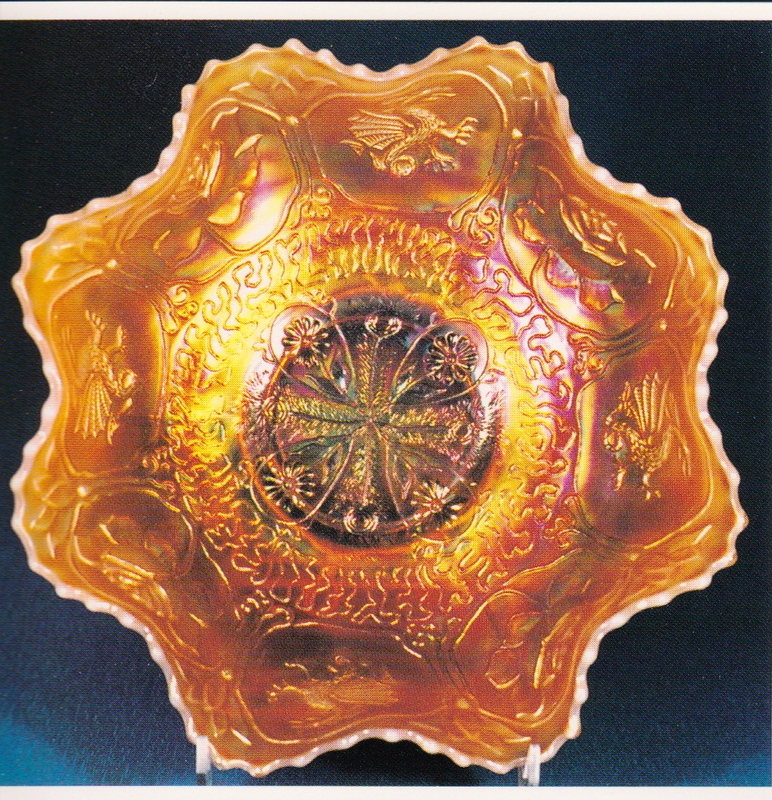 It is largely confined to the edges and the back compared with the heavy opal on the interior of most of the Dugan and Northwood pieces. 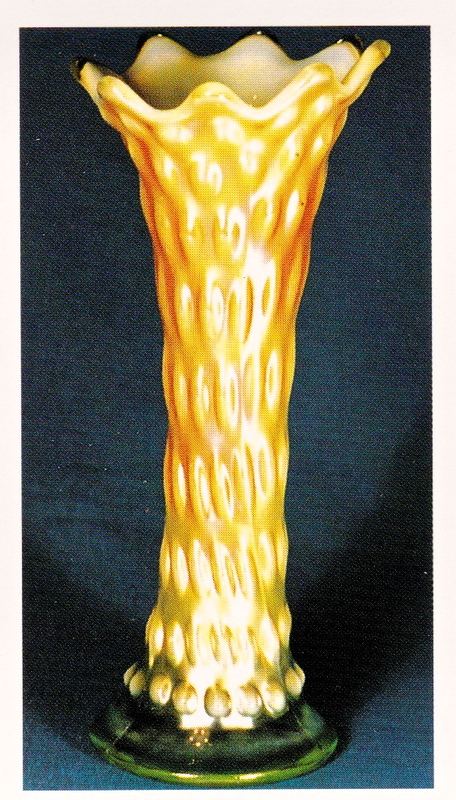 Nevertheless these Fenton pieces are beautiful in their own way and eagerly sought after by collectors. 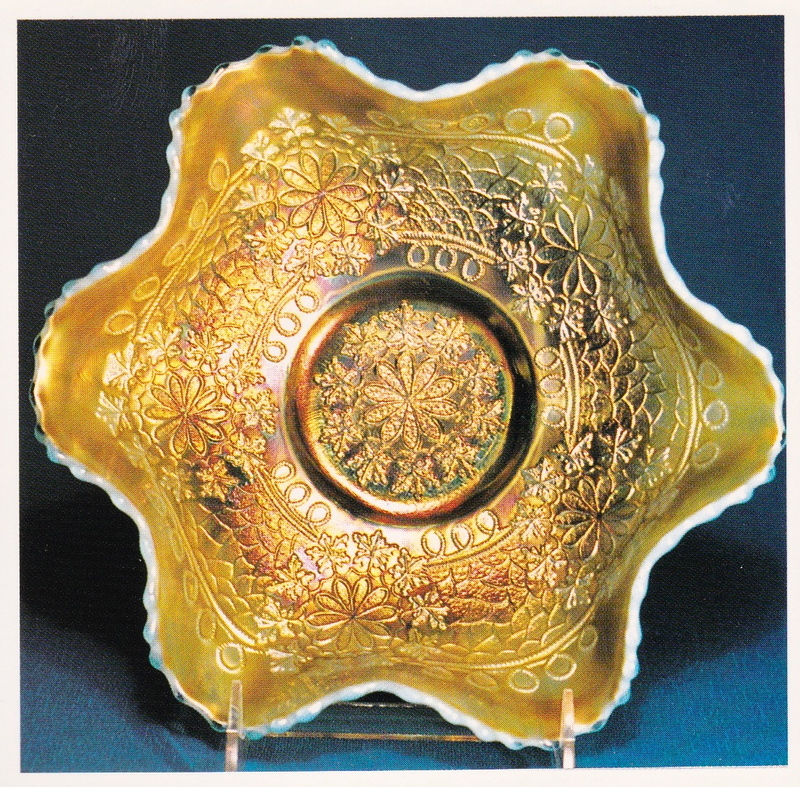 These pieces were a very minor percentage of Fenton’s production but it is still quite an impressive array of patterns and colors. I’m sure I’ve missed a few but here is a listing of those I am able to confirm. It should be remembered, however, that a number of these are one or two of a kind and in some cases appearing to have been experimental. I have indicated the number of pieces I can confirm or reasonably estimate in the parenthesis following each piece. Some of them are shown in the color spread which accompanies this article. 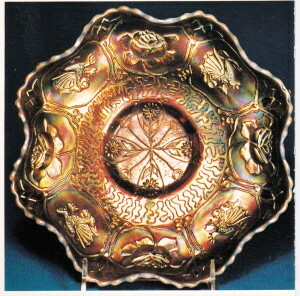 Dragon & Lotus This pattern was more widely used for Fenton’s opal edges than any other. 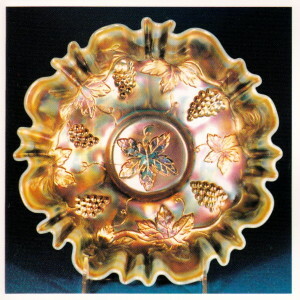 In addition to the peach opal, amethyst opal and lime green opal bowls shown, it was also made in aqua opal. These are all rare and demand premium prices. 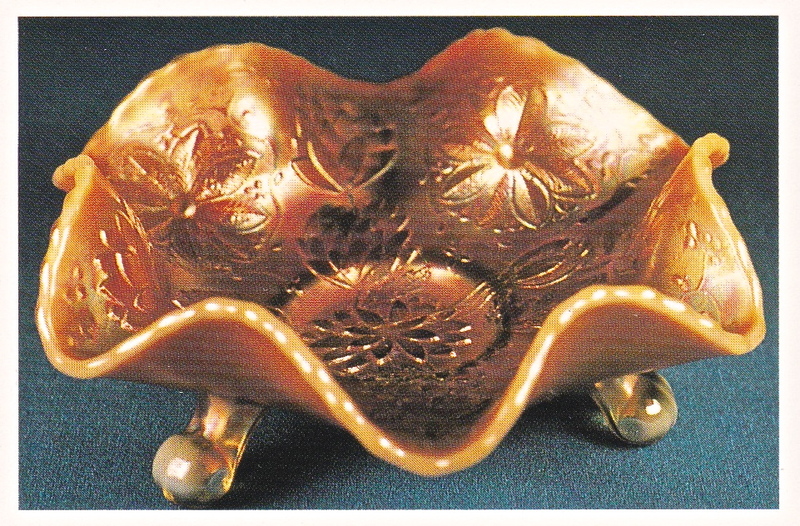 A peach opal bowl brought $750 at auction in 1987 and a footed plate in the same color sold for $875 in 1986. To my knowledge neither the aqua opal nor amethyst opal bowls have sold at auction in recent years. I know of only two spatula footed plates. They are both peach opal. Most of the bowls are collar based but a few lime green opal and peach opal ones have been found with spatula feet. Vintage As far as I know, aqua opal was the only opal edge used with this pattern. 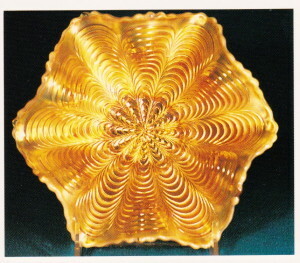 It was used largely on 9” bowls but in a variety of shapes including ruffled, tightly crimped & three-in-one (ribbon candy) edges. A very few 6 1/2” ruffled bowls are also known. The ribbon candy edge bowl shown in Photo #3 sold at the Funk auction in 1989 for $2,000. The tightly crimped edge bowl (Photo #4) will sell in much the same price range with the ruffled pieces bringing somewhat less. Orange Tree Only one plate and one bowl are confirmed in this pattern in peach opal. 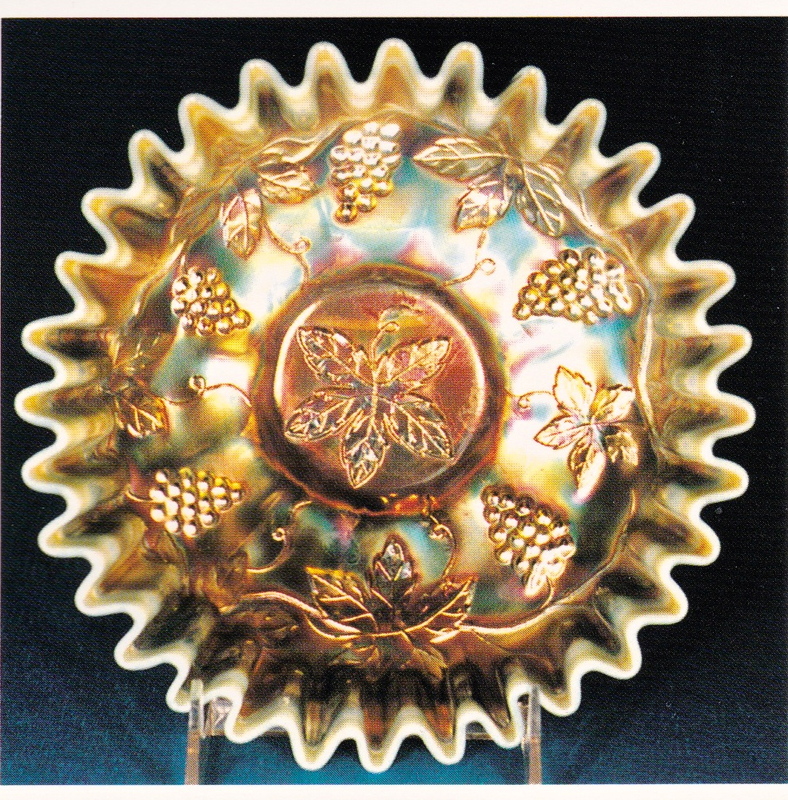 The opal is confined largely to the edges and the back of these pieces. 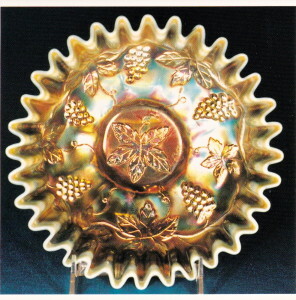 The opal on the reverse side is uneven and they have the appearance of being experimental pieces. 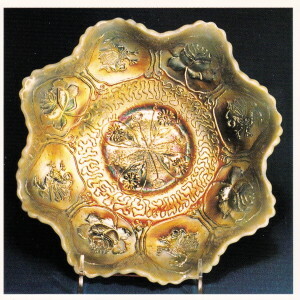 The bowl shown here sold for $2,000 at the Britt auction in 1989. Leaf ChainThree of these, one bowl and two plates, have surfaced to date. The bowl shown here carries the bulk of its opal on the edge and especially on the back where it is very heavy and runs two thirds of the way to the collar base. The three pieces known in this color have been in private collections for many years. I’m sure they would bring a big buck if offered at auction. Water Lily These 6” footed sauces are very popular and very scarce in any of three opal colors in which it is found. One is lime green opal, as shown in the photo, sold at auction in 1987 for $600. A red opal one sold for $750 in 1988 and one in reverse amberina opal sold in 1987 for $450. Rustic (Photo #11) Two of these vases are confirmed in lime green opal. They are both the small size. 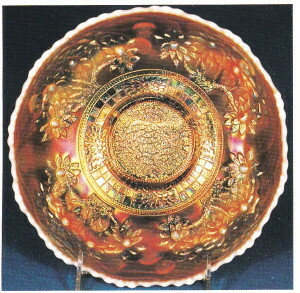 The one shown here carries heavy opal, particularly on the interior, quite similar to cased glass. One of these sold at auction in 1985 for $375. I expect they would bring substantially more if offered today. 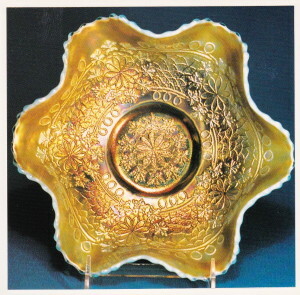 Peacock Tail (Photo #12) This 6 1/2” ruffled bowl was in a collection we bought several years ago. It is the only one I’ve seen in peach opal. A rare color in a common pattern. Well, that’s about it. Each color spread I’ve done for the last several years was intended to be my last. I must report, however, that our last two club presidents, Bob Lovell & Carl Schroeder, have employed threats, bribes and other unfair tactics to squeeze just one more out of me. I’m old, tired, and out of subject matter so this may be it. I’ve enjoyed doing them and very much appreciate your generous comments over the years.